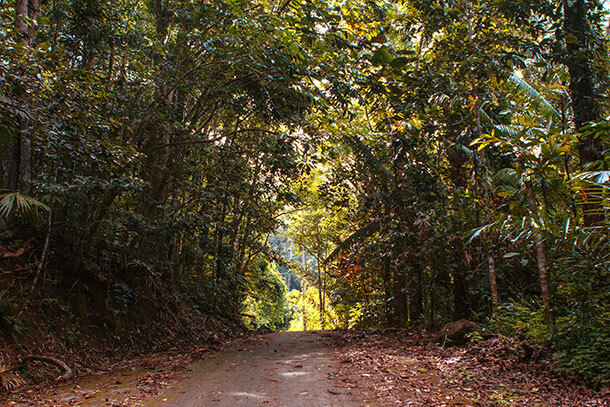 Siquijor’s mountain tour involves only two (2) siquijor tourist attractions. But it is easily more exciting and energy-demanding than the coastal tour. When we visited Siquijor, I’ve mentioned that there are two popular tours travellers can choose from: the Coastal Tour and the Mountain Tour. I have already covered the things to do and what to expect on a Coastal Tour on my previous post. On this post, I am going to talk about the Mountain Tour, things to do, what to expect and travel tips to make your experience fun, exciting, safe and convenient. 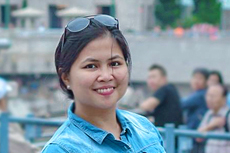 The tour basically covers two places: the Mount Bandilaan and the Cantabon Cave. It’s less than a 30-minute drive from the Siquijor Port. We went there on our 2nd day in the island and it was a memorable way to remember Siquijor. After grabbing a quick breakfast near the St. Francis de Assisi Church we were immediately ushered in to the multi-cab we rented for the day. We were a group of five and tricycles (which we used the other day) can’t climb the steep portion of the way. So the only option for us was to hire a multi-cab. When we went there, the rental of the cab for the activity was at 1,800 Php. This includes the driver, the fuel and our transport pick up from the hostel where we were staying to the Bandilaan and back. If you want to DIY, you can simply rent a scooter to take you. There are scooter rentals in town you can check out. As of writing, the scooter rental is at 350 Php but you need to present a driver’s license and you need to have the proper gear. If you are wondering how much it’ll cost you, the trek to Mount Bandilaan is free. 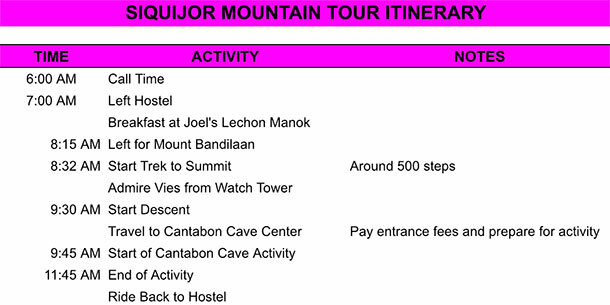 Basically you’ll only be paying for the caving activity and the transport to and from the Mount Bandilaan. Basically the activity will take around 4 hours so you can do it during morning or in the afternoon. Personally, I’d suggest if you can do the trek first before the caving. The trek will serve as your ‘warm-up’ for the caving activity later on. Besides you’ll be wet by the end of the activity at the cave so it’s better if you can go change or maybe relax at the Cambugahay Falls or Paliton Beach after. Mount Bandilaan is considered to be one of the highest points in Siquijor. It is located in Brgy Bandilaan. There is no entrance fee when you do the trek. There are no guided tours here too so you can just be your own guide. We actually requested our driver to be our guide when we went there as we did not know the area. 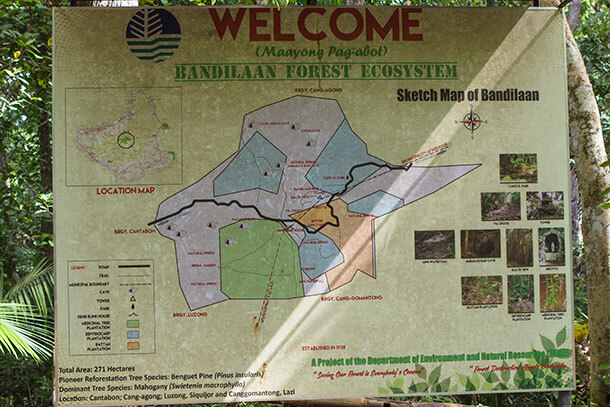 If you have more time, you can also check out other areas in Bandilaan. 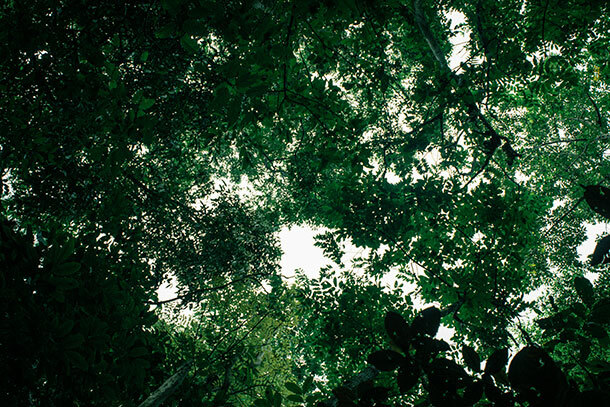 It is also known as the Bandliaan Forest Ecosystem. Here, you can also check out some other caves, natural springs and mini-waterfalls. Trek Time: 20-30 minutes one way. The Cantabon Cave is an 800 meter stretch of cave in Brgy Cantabon known for its gorgeous stalactites and stalagmites. As mentioned above you can either do this before trekking to Mount Bandilaan or after. It’s your choice. Doing the activity requires that you have a local guide to take you and that you are equipped with the proper gear. PS: I don’t have any photos of the cave as we did not bring our camera with us. Nevertheless, the entire activity was memorable that it is etched in my memory forever! Registration is done at the Cantabon Barangay Hall. Here, you can also rent some gear that you can use as well as lockers to leave your things behind. Fee is at 500 Php for three person. This already includes a guide: that’s 1 guide to 3 guests. But for some cases, they provide 2 guides for a group. We had a total of 3 guides with us when we were there. You will need to wear protective head gear / hard hat when doing the activity plus head light. This and the locker is already included with the fee. You may also add to rent non-slip shoes and cellphone pouch, should you wish to for a fee. Ours was at 50 Php for the shoes and 50 php for the cellphone pouch. There is only one entrance and one exit so you’ll be going back the way you came. If the Coastal Tour was a bit relaxed, the Mountain Tour is not like that. You’ll need a good night sleep to complete. Kidding! hahaha.. But seriously, it’s more physical so expect more walking, getting wet and climbing. For a summary of things to do, here’s an overview (not so brief, of course) of what we did and what you can expect when you visit. The trail, while evident with stones is not that clearly marked. We got a bit lost with our guide who went on ahead of us. There was a fork on the road that got us a bit of confused to be honest. And the trees were a bit dense on this area. 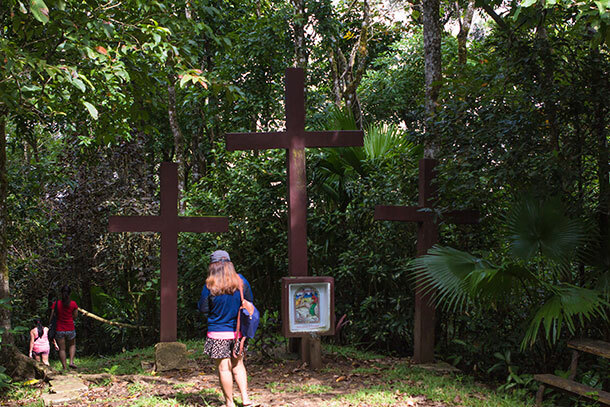 There are statues of the stations of the cross along the trail. This gave me the impression that this was a site not to be missed during the Holy Week. Much like the Walkway to the Old Volcano & Stations of the Cross in Camiguin. The trek to the summit will take less than 30 minutes. Our guide previously said it was 300 steps, but I guess he was kidding as it was about 500. LOL. The peak of Mount Bandilaan is surrounded by tall trees. There is a watch tower at the centre where you can climb up to see more of the views. A limited number of heads is permitted though so if you come here during the Holy Week, please be mindful about that. We were the only ones who were there at that time so we had it all to ourselves. 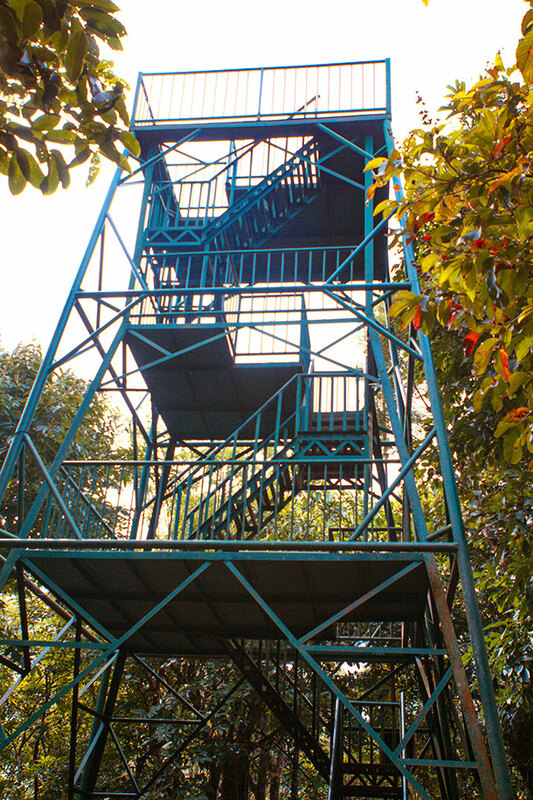 The climb to the top of the watch tower is alright so no worries of over-exerting yourself. There is not much view of the surrounding areas here though. It is covered by the trees. Nevertheless, the fresh air will definitely relax you. As mentioned above, you will need to have a tour guide when doing the tour. The guides we had were young but were knowledgeable. They mostly explained about formations and pointed out the cool and unique formations of the stalactites and stalagmites. It’s pretty cool to learn how and when the cave was first discovered. As well as about the entrances and exits and all other interesting stuff. Expect adventure when exploring the Cantabon Cave! You’ll be climbing over boulders, slipping down at some slope, walking on thigh-high waters and stretching your legs to reach the other side. LOL. And most of all, you’ll be hitting your head on low ceilings (well, at least I did and it was not fun. LOL). You’ll be wearing a hard hat all throughout so serious injuries will be avoided as much as possible. I am short so it’s saying something when I say I bumped into the ceiling. Or maybe I was just clumsy. LOl. Nevertheless, watch your head, guys! The guides will take you to several interesting stops in the cave. They were marked of course so you won’t miss one. You’ll be able to see various interesting shapes like a bed, a rice terraces, an altar and more. Please be careful not to touch them though as this causes a reaction wherein the stalactites and stalagmites die and turns brown. There’s an area in the cave where you can swim in waist-high pool of cold and fresh water. Well not really swim, but soak in. We did this on our way-out and it was a good way to partially end the activity. There was still about a 10-20 minute walk towards the exit so we were feeling pretty refreshed by this time. The ‘pool area’ was located on a high ceiling area and you can definitely get a good view of the cave and enjoy the cool water. 1. Be sure to wear comfortable clothing when you do the Mountain Tour. T-shirts and shorts that are quick to dry is preferred. You can wear long sleeves and leggings too. 2. Non-slip and closed-toe foot wear is appropriate too as there are pretty slippery and sharp areas inside the cave. 3. Secure all your valuables (if you opt to bring some) with you. As mentioned, you’ll be climbing over and going down some pretty slippery areas so its essential not to loose anything and keep them secure. 4. Listen carefully to your guide and follow their trail. There are slippery areas and you can get hurt if you don’t follow properly. 5. Please don’t touch any stalactites and stalagmites as it can kill them. 6. Don’t litter inside. If you have trash with you, wait until you get out of the cave before disposing them. 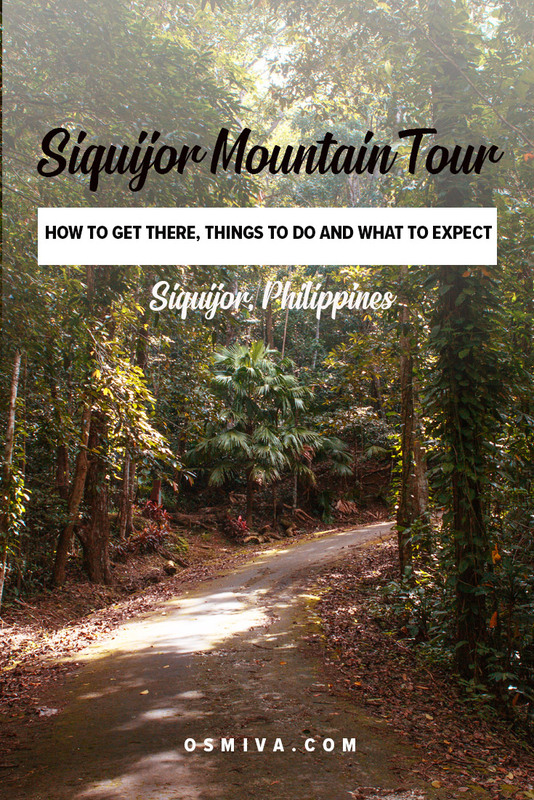 The Siquijor Mountain Tour can be exhausting (especially if you haven’t had any cardio exercise before. LOL) But it is pretty worth the effort especially the caving at the Cantabon Cave. I read your post and it is so interesting and informative. Thanks!! Me, as a nature and wildlife lover; i can tell, this spot is worth to visit. Would love to go there one day by using your tips and tricks. Looks lovely. So far I have only climbed Mt Ugo and Pulag in Philippines! Not yet got to try this mountain!